Three idiots getting their righteous comeuppance by a blind guy who might as well be the murderous arbiter of justice visa vi Charles Bronson in Death Wish? I was totally on board with this premise. But Don’t Breathe is more complicated than that. Despite the perfect opportunity to make the antagonist a blind, vengeful, and murderous Batman; the film, unfortunately, wants you to root for the three idiots. As a result, our blind antagonist is less like Batman and more like Buffalo Bill. To reveal any more would spoil the film, but needless to say, not everything is as it seems. 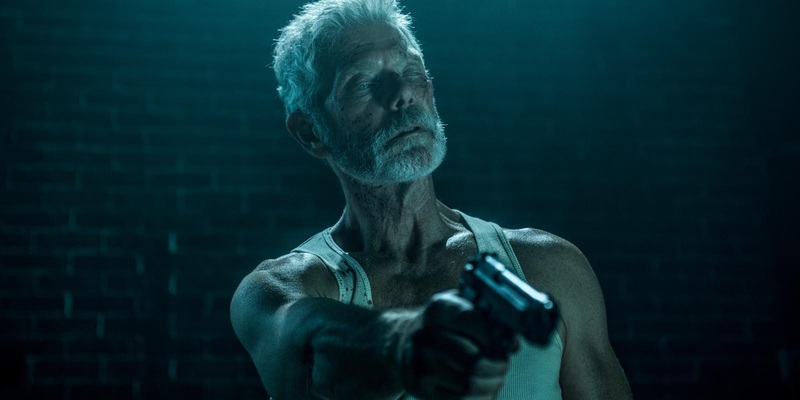 The Blind Man/Norman Nordstrom (Stephen Lang) is a fantastic menacing presence who speaks like he drinks gravel coffee for breakfast. Relying on his other senses to capture and kill our protagonists makes him an interesting and fresh villain. He’s not a superhuman killer, but he is a limited but extremely resourceful one. The makeup artists deserve particular credit for making his eyes look as unsettling as possible. Of our three main characters, we have our red shirt, Money (Daniel Zovatto; Yes, that really is his name), who is so deplorable that you cannot wait until he is murdered. He’s a white guy with cornrows, tattoos on his neck, speaks like a black guy who forgot he was white and is generally an all-around ignorant brash jackass. The only way they could have made him more unlikeable was if they made him a Juggalo with a Detroit Lions tattoo on his face. Alex (Dylan Minnette), the wisest and most sensible of the three, plans out the robberies and has an obvious crush on Money’s girlfriend Rocky (Jane Levy), the pretty girlfriend from a broken family. She’s the only one that has much of a backstory besides The Blind Man. She is desperate to escape her abusive family and the ruins of Detroit, but desperately needs money to do so. The movie is directed by Fede Alvarez (Evil Dead 2013) and wastes little time to get going. The first quarter of the film sets up our protagonists (and antagonist for that matter), their motivations, goals, and the plot, before getting right down to business. The tension building is effective as we wait for the other shoe (i.e. The Blind Man) to drop. Indeed, the film is successful at keeping this tension high throughout the film. They desperately try to escape and hide from The Blind Man, sometimes right under his nose. You never know when he’ll pop up, nor if he’ll hear, smell, or detect the protagonists somehow. The first, long camera take through the house is an excellent way to establish the spatial boundaries of the film for the audience. Alvarez’s use of sound is loud and nasty. He compliments this with excellent horror timing on the part of our blind antagonist. In particular, the night vision black and white scene shown prominently in the trailer is a standout for providing edge of your seat anxiety. Don’t Breathe isn’t very scary, which I suppose will be the death knell for many horror aficionados. But it is an extremely tense thriller. The simple and fresh premise draws you in and keeps you guessing, while the tension is derived from simply trying to stay quiet and avoid The Blind Terror. The film flips the script on the viewer and takes a deeply disturbing detour that’s as horrifying as it is jarring. It’s ending is perhaps the ‘happiest’ outcome that could have happened but it's still bleak. 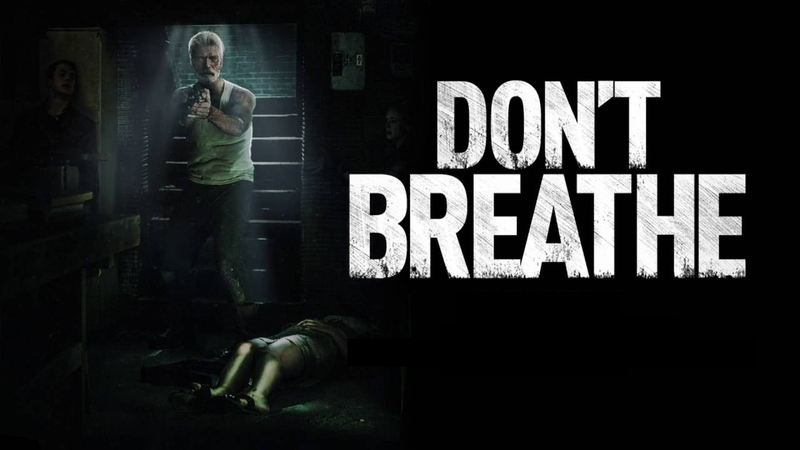 In the waning days of this terrible summer of movies, Don’t Breathe offers a rare respite from the doldrums. It may be a violently perturbed respite, but it's still a good one.